Almost every grocery store (and most convenience and gas station stores) carry Evian Spring Water. They have not strayed from using actual spring water and you can definitely tell. We use Evian Spring Water when we need it. It works fine for my wife and I. Thank you all for replying to my post, especially Joseph Magnuson, who provided the name of a specific brand of spring water to use. I will have to look for Evian Spring Water. If you hired a root worker to do the enemy work for you (your hands and body never touched the enemy work), do you still need to cleanse with a hyssop bath? Yes, your wish to do harm to someone was why the work was done, you started the chain of events that led to the person being crossed, thus you need to take a bath in hyssop and ask the Lord to forgive and cleanse you of your sins. Okay, so I did a hot foot candle to remove someone who was dangerous from me and my family's life. Unfortunately, they are a relative. Anyway, the hot foot candle was burned about 4 weeks ago. I did not burn it myself, but had it burned for me. I recently discovered that I was supposed to do a series of hyssop baths while the candle was burning. However, I did not take any baths, but instead followed the hot foot candle with an uncrossing candle for removing negativity that I always have around me (besides this hot foot family issue). 1) I've been experiencing some negativity and wanted to know if this could be a result of not taking hyssop baths. 2) If so, will taking one day of a hyssop bath fix this situation? 3) What else should I do? 4) Should I be worried that I did not do the hyssop baths, or is a more of a preference than a necessity? 5) I did burn a protection candle about 2 weeks before I did the hot foot candle. Is this effective? 6) In regards to the hot foot candle, at first, it seemed to be working, but now the relative has returned and is causing trouble again in my life, the only difference is that he knows he is not wanted, which makes him at times, even more of a danger. He is not around all the time like before, but comes and goes with all sorts of negativity which I can't handle! I wanted to know if this is how hot footing works sometimes, it gets bad before it gets better? 7) Or is this a sign that it did not work? 8) I haven't gotten a candle report back for anything, so I just looking for insights of success or failure, and advice on what to do next. MarkiMark615 -- what you "recently discovered" is not anything i have ever heard in my life -- and i have been doing this all my life. Either you heard it wrong or you were told wrong. There is no tradition in conjure as i know it that states that you are "supposed to do a series of hyssop baths while the [Hot Foot] candle was burning." Rather, the tradition is that if you curse someone (and Hot Footing is a curse, make no mistake about that, even if you hire someone to set the light for you), then you should get right with God by taking a Hyssop bath and reciting the 51st Psalam. Period. That is all. No "series" of baths. No baths "while the candle is burning." Just a bath after the work is done. 1) Yes, if you have cursed someone and not gotten straight with God, you may indeed feel "some negativity." 2) Asking God to forgive your sins, if you have sinned, is always a good idea. One Hyssop bath and a recitation of Psalms 51 is the usual method. 3) Some folks also drink a little Hyssop tea. 4) That's between you and God. 5) That has nothing to do with the fact that you cast a curse. 6) No, this is not "how it works." It may be that the person is strong and is resisting. It may be that the person is somewhat protected. It may be that God took it all back because you didn't pray for forgiveness for the curse afterwards. Hard to tell without a reading on that. 7) That sounds wrong, because you say that it DID work, for a while, then stopped. Let's look at Hot Footing. Do you know what it really is? It is FOOT TRACK MAGIC. It involves CONTACT with the person's feet. Do you know that Hot Foot Oil (to dress candles) wasn't even invented until the mid 1940ds? People did not burn Hot Foot candles -- they HOT FOOTED folks -- with Hot Foot Powder. I think a candle is nice and may catch a few people -- but in no way is a candle going to pack the punch that real, old-fashioned Hot Foot Powder does. I make and use them both. I am speaking from experience, so... burn a series of the candles if you don't want to do the real work of Hot Footing the person. 8) Call and ask for Katrina or Fran. Tell them you want your candle read right away so that you can decide what to order next. Thanks for your input. I spoke to both Fran and Katrina, and I should receive my candle report really soon. I will also do a Hyssop bath this Sunday, because it is the day for blessings and health. I was told that I need to perform a road opening cleansing. Orange candle, road opener oil, and some ammonia and salt to take a bathe in but just let the liquid go down the drain. Next a basil and honey bath, then a cinnamon and honey bath. Can I get a rootworker to perform a long distance road opener cleansing on me instead? You take the water to the crossroads because it is a part of the ritual and it is necessary to complete the work. The reason why you take the water to the crossroads is because you want the negativity to be carried away from you. Okay I had a uncrossing done, road opening, and job getting. My family members and I keep having money blockage try to get the apartment on rent did not work out, trying to sell the home overseas nothing happen yet, I am trying to find a job, sending resumes, no luck yet, we keep living paycheck to paycheck..something keeps coming up to take money out of our pockets. I am trying to get myself in a better situation financially but its not happening. my dream tells me there is a huge obstacle there...something is keeping me from progressing in life. I cant make moves. I'm stuck. how am I ever going to accomplish my dreams in life? Why have talent and potential when you cant use it? It sounds to me like you may wish to do some work for having your money -- no matter how much comes in -- stay with you. One way to achieve this is to use rootwork to protect things around you from breaking down, getting lost, or needing to be replaced. A popular formula for this is Money Stay With Me. Using it on your money, as a dressing, help-s you slow the outflow until you get a job and have more inflow. 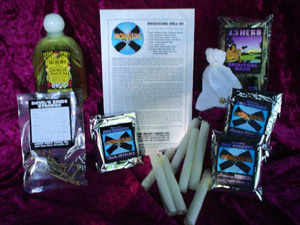 You can get a rooworker to do a long distance cleansing on your, and several of us at AIRR are adept with that kind of work--however, if you are suffering chronically around road opening and financial stability/success then I recommend that YOU do some personal cleansing as well. Spiritually cleansing your home and personal spiritual bathing are powerful tools of transformation-you are literally putting magically and spiritually significant ingredients in your dwelling place and on your body-that is powerful so I would recommend that you bathe yourself if at all possible. What you may wish to consider is having an AIRR member "back you up" by also doing distance cleansing and/or setting lights for you. My root worker wants to do another reading because one of the candles she had lit for me went out abruptly. I am going to mop my house out with sea water and ammonia then some ammonia and salt to take a bathe in but just let the liquid go down the drain. Next a basil and honey bath, then a cinnamon and honey bath also get some blue,spirit of turpentine and sea salt put it in the corners. Hi to all, I was wondering when your finish with the road opening candle do you have to bury it by a crossroad or throw the candle and petition in the sea or just have a rootworker light a candle for me instead and handle the disposing etc and I just do the cleansing? The rootworker did the long distance cleansing on me it was not successful and the job getting candle went out. Let's say you get all of your bath water, candle remains etc ship it to your root worker and let them dispose of it for you...can this be done? evilkandy wrote: Hi to all, I was wondering when your finish with the road opening candle do you have to bury it by a crossroad or throw the candle and petition in the sea or just have a rootworker light a candle for me instead and handle the disposing etc and I just do the cleansing? You do have to dispose of any left over candle wax from the spell, no getting around that. If your working to open your roads then you should bury the wax at a crossroads, glass from glass encased candles should be recycled. Yes you might be able to hire a rootworker to handle the candle work at a distance while you take baths, having someone light candles to back up the work you do is fairly common. You would still have to dispose of the bath water of course. evilkandy wrote: Let's say you get all of your bath water, candle remains etc ship it to your root worker and let them dispose of it for you...can this be done? I don't know of any rootworkers that will dispose of your spell remains for you, and honestly the idea doesn't sit right with me. You did the work, you should dispose of the remains in a respectful and traditional manner. If you have a problem with disposing of spell remains in a traditional manner than you're going to have to get passed that, it is a very important part of most forms of magic and of hoodoo in particular. If you have any "problem" with ANY part of the spell work then you need to concentrate on getting passed that, as Turnsteel said above, or have a profession do the work properly for you for it's full success. This rootworker told me to bathe in ammonia and salt and let it down the drain for a week then the following week basil and honey for a week then cinnamon and honey twice. He said to let it go down the drain and that I don't have to go to the crossroads. I dont know if I should say something while cleansing or if i should rub upwards or downwards.. also can you save up all of your bath waters (from each bath) then dispose of it at the crossroad? Asa you already have a rootworker who you go to, you should ask them rather than the forum. They have set a prescription for you to follow and as such you should feel comfortable asking these questions to him/her. That said; I, personally do not save up bathwater, I take it to the crossroads after each wash. That is a traditional part of the bath/spellwork. If you are doing this for Cleansing then wash downwards to cleanse and remove old conditions. Should you say something while doing the bath? I know I do, but this is up to you and/or your personal rootworker. Stop reposting the same message please. It is hard to follow the thread that you started with the same message being pasted over and over. Give people a chance to respond to that as they read through the thread. Thanks. As far as what your rootworker told you to do, if they are from AIRR, then discuss those questions with them. No one is going to want to step on another rootworkers toes. If they are not with AIRR, then you should consider getting a reading from one of them so that you can get a better answer than what you will get on the forum. I have done road opening candles, taking the water to the crossroads after cleansing baths, got a reading and been told I am not jinxed or anything. I have seen my candle work so well in areas of prayers of health for family, but my career, and money situation still seem stuck. Does anyone have a suggestion on what they have found to "move" a situation, or patterns in ones life that seem very stuck? Everyone is not gifted for every type of work. You may not be skilled in money work and might benefit from hiring a rootworker. Another possibily way forward might be to hire a magical"coach" to help you with the work. This costs less than hiring full-out conjure work. Depending on who you hire, it might also include practical business coaching as well as spiritual assistance. My husband put our family in a deep financial hole with his bad decision making! I feel like he is jinxed for bad luck since we got married 7 years ago. What is the most effective way to get rid of this bad luck? We have a 2 year old and I am terrified about our future! Use Van Van to turn your bad luck into good and King Solomon Wisdom to make better decisions. There are several money formulas that you can use: Money Drawing, Money Stay With Me, Wealthy Way, and Prosperity. Read the descriptions and choose those that are best for you. I really like the choice of scripture, Mama Micki. Some Cast Off Evil might also be useful in this work. Following Mama Micki's scripture I ordered the supplies I need to perform the cleansing. Meanwhile, I am burning the Double Action black-over-red candle and not sure if I did something wrong. I cut off the tip and carved "My enemy" in reverse with rusty nail. But I don't think I carved it right on the other end. I made a well instead of a tip. The candle is burning, but the black coating would not melt. Then on the side where I carved 'my enemy' sign, the black coating made a slit and the red wax poured over the carving like a mountain. Also, I am feeling light-headed since I started burning the candle. Does it mean anything? Should I stop and get another candle and start over? What enemy? You said your financial problems were the result of your husband's bad decisions. This is my second unsuccessful marriage, In addition to my husband bad decision making and being overly controlling. I am not sure, but I feel like all this is the result of my misfortune. It is a long story, so I am trying everything I can to rid off curses and bad luck. I am not sure what causes my misfortune. I just know I can't live this way anymore. I know it sounds confusing. A 13-herb bath will remove negativity, whether it originates from outside sources or from within yourself. This is probably a stupid question, but how do I know if I need to cleanse? I mean I understand why you would need to cleanse after D.U.M.E. work for example, but do you need to cleanse after doing anything with Separation or Controlling? How about Vinegar Jars and Freezer Spells? What exactly constitutes "Enemy Work"? I'm really more of a "Harm as Infrequently as Possible" kind of person and so far any curse work that I would seriously consider is usually (in my view) done in self defense so I wouldn't consider it a sin. I'm just not sure where the line is. As a general rule, cleansing is wise even if cursing work is justified. A simile I've read often on the forum is that cleansing after ''enemy work'' (which includes vinegar jars, separation work, crossing, etc.) is like washing after playing out in the mud. The playing is justified, but it doesn't mean you don't get dirty and need cleaning up. When it comes to binding and controlling work, I'd be interested to see what the responses of others are, because unless there are herbs/curios that would negatively affect someone (like in the case of a mirror box, couch grass, hot peppers, etc. ), I personally wouldn't do any elaborate cleansing other than cleaning off my hands and work-space with some Florida Water or a cleansing herbalized spray of some kind once done. In both kinds of work however, keeping the work within a border of bay leaves can be wise to help avoid detection of the work. Cleansing at regular intervals (monthly or weekly) is a good idea. You can use 13-herb bath, which contains hyssop, or just hyssop. Thank you Aura, for your answer! I never heard of doing your work within bay leaves but that sounds like a really good idea. Would you or anybody else be able to explain to me what the definition of enemy work is? I want to understand the parameters. Why is it considered "enemy" work? And Mama Micki, thank you too! I absolutely need to start regular cleansing. Would this apply to my home and work area to, or just to my person? Thank you all for your time, I really do appreciate it! Enemy work is work against someone who is working against you, not necessarily in a magical sense. It could be an abusive ex, a bad neighbor, your husband's girlfriend, or an obnoxious co-worker or boss. The work is usually something like Crossing, Reversal, Damnation, or Destruction. Of course, DUME is the ultimate enemy work, but it should be reserved for those cases when there are no alternatives but causing the enemy's death. "Someone who is working against you." Thank you Mama Micki, that is perfect! Now, is a person an enemy if they just don't want to do or wouldn't normally do something that you want them to do? Like a boss who doesn't want to give you a raise or an ex lover who doesn't want to come back? Or are we only talking about people who are actively working against you in some way? Like an abusive relative or someone who burgled your house? Also, if anybody has any thoughts about whether or not controlling work would be considered enemy work I would love to hear them! What if it is a type of work where you, for example, repeat the ritual several times? For example, a 7-knob black candle used for cursing? Would one need to only cleanse after fixing it and then lighting it for the first night? Or would it be better to cleanse each night after lighting? This is my first post on the board after having read most posts here (and there's a lot ). I read about Psalm 51 using hyssop after "darker" rootwork "Purge me with hyssop, and I shall be clean; wash me, and I shall be whiter than snow", so since there's thick snow now, where I live, I collected tons of snow, then let it melt, then sieved it through white cloth (to rid it of possible dirt) and stored it in large bottles. I intend to save it for cleansing with hyssop instead of using spring water. Just liked the idea of actually using snow. Lightness, this is a great idea and I have been hearing from multiple practitioners of their doing the very same thing. I think it is wonderful...as long as you don;t live in an extremely polluted area, of course! Hey guys, I 'll make break - up spells and hex,jinxes.. So what bath and herbs do you recommend that remove negativity from me after spells? 13 Herb Bath would be really good. A hyssop bath is traditionally done after "dark" work, along with praying Psalm 51, which mentions cleansing with this herb. do we need a cleansing bath after a vinegar spell ? i intend to put someone in vinegar and freeze it , do i need cleansing after that???? Yes. Cleansing after a vinegar spell is adviced. Its a dark spell an you don't want the affects of it in ur life. Simply bath in 13 herbs ams pray all ur dark work not affect u but the targets its intended for. You can never go wrong with a cleansing. I think if you are asking if a cleansing is needed there is probably something telling you that you should cleanse and I would always follow that feeling. So, I'm preparing to do some crossing work for the first time and I wanted to ask you guys about precautions I should take before doing it. I don't want it coming back to haunt me, you know ? What cal I do to protect myself, my house and my family? Thanks you guys. This site has been SO helpful. I'm so glad I found it. However many experienced workers believe that it is more important to protect yourself against a reversal of the spell and/or just retribution AFTER doing the work, and that to do this, it is best to cleanse and protect afterward. This thread is about just that. Read it through for lots of good advice. I don't intend on doing dark magic or spells which involves in harming people. I only want to focus on spells regarding love, fidelity, blessing spells etc. It's not considered dark magic right? Even though, I still feel a bit "guilty" somehow for doing spells, is there some kind of cleansing or protection spell that I can do to cleanse the white magic acts too? Thanks! We don't cleanse ourselves in hoodoo after performing beneficial work since there's nothing to be forgiven for! If you feel ill at ease with using magic: don't. Cleansing outside the context of spell-work is done regularly as a stand-along practice by most workers to get rid of accumulated energies or ''crap'' (call it what you like). 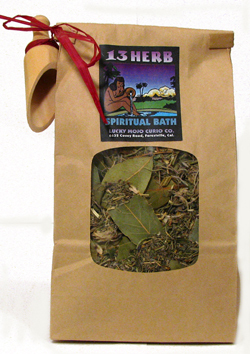 Most will take a spiritual bath in Uncrossing bath crystals or 13-herb bath tea. Either is a good choice for general cleansing. Alternatively, there are a lot of traditional bath recipes used to spiritually cleanse the self. One I like uses a cup of salt, a half-cup of vinegar and a crushed cube of Reckitt's. The ingredients would be prayed over and then added to a full tub of water. Before and after doing a spell, should I cleanse myself? Thank you! It is not the custom to cleanse oneself after doing a spell for drawing, increasing, or getting. You want to keep what you did on you. It is not the custom to cleanse oneself after doing a spell of removal of negativity because the jinx killer or uncrossing spell IS a cleansing trick, so cleansing would be redundant. It is the custom to cleanse oneself after doing negative tricks against another person, such as hot footing, destruction, break-up, or jinxing. This is done to take off your sin. A protection spell is not something you would want to clean off of yourself! There is a section of the forum all about protection spells -- read more there and ask there if you have questions. I am planning to do a moving spell with 3 candles. I read that I use pink or red for me And the person I want closer and black for the person I want to go away. The thing is that there's no specific person for the black candle, and I read that I can just put "all rivals" instead of one specific person. I will use separation oil on the black cndle but it's not to hurt anyone or curse anyone. Is this considered that dark that I really need a cleasing? I do have hyssop herb and I can bathe in it and Chinese wash to cleanse my area, but I am wondering because I have a child and would like to know if the "negativity" can influence her she will be in the same house, different room of course. But like I said there's no specific person in mind and I don't want to harm anyone and I'm not really breaking up anyone because he's single. Thank you. I'd do a cleansing at the very end of the spell work, but you should be fine throughout without any extra measures.